Mancala Game Sets – Our Mancala Game Sets are made of solid wood, feature a handsome Oak-finish, and come complete with 48 glass gemstone Mancala playing pieces. The Game measures 8½" by 5¼" by 1½" when folded and 17½" by 5¼" by 3/4" when used for play. Order 24/7 through our secure online store or contact us at 1-800-233-0828. 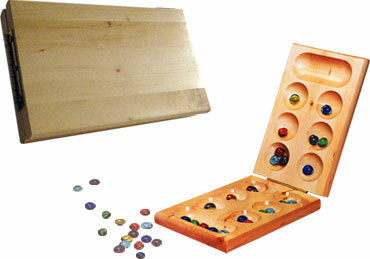 For additional information on our Mancala Game Sets, please contact us at 1-800-233-0828. Feel free to browse our other Classic Game Sets including and Cribbage Sets.